There’s ten days until NaNoWriMo takes over whatever scraps of free time I have. I know I’m going to need to prepare for this because people with less on their plate are posting how they fear they will not be able to win. No I didn’t write that line to beg for people to praise me and tell me I can do it, nor did I write it because working a full-time job isn’t tough. All I mean to say is if back when I worked a full time job I’d known how little free time I would have with a child at home I would have put in more effort to wisely use the free time I had back then. Even now I’m sure there are people reading this rolling their eyes thinking, “Jeeze, you only have one kid? You don’t know how good you got it.” So I’m not trying to say I have the biggest load on my plate either. Well, suffice to say, I know I need to plan this out, because I intend to knock this out of the park. 1/ Finish my final read through of the altered Storybook Perfect so I can be submitting it while I work. Ok, sure that doesn’t sound like it should be important, but I don’t want to leave something so close to finished undone, nagging away at the back of my mind. In a fit of procrastination I might go back to finish it and loose precious time. Also I’d like to be doing something to get it back out there ASAP. 2/ Pick my story. Well technically I’ve done that. If you’re already following my Facebook page you will have seen the synopsis I put up. The synopsis is still a little raw, not quite pitch perfect, but it definitely gets the idea across. Follow this link to my NaNoWriMo page and you should be able to read it. Feel free to tell me what you think. 3/ Set up plot outline in Scrivener. Since the idea isn’t brand new I’ve got plenty of ideas of how I want the plot to go and the themes I want to bring up. It’s been rolling around in my head for a year or two, but has always been on the back-burner because I have so many stories I’m desperate to write that it hasn’t had a chance to come to the front. I have a very large, very active back-burner. 4/ Set daily word count goals. 50,000 divided by 30=1667(why do keyboards have no division sign? Is there a HTML way to make them?). But I intend to goal more heavily in the early weeks so I have a buffer for busy days/writers block/illness that may strike later on. Being a mum has made me very safety conscious ;p I want to make a tickable calendar so I can track days I was under and over. I already track word counts(when writing) and page counts (for revision) in my five year diary, but I want something I can absorb in one glance. edit 24/10/12: I’ve done this now, and I’m sharing it. The calendar is fairly simple, just an Excel spreadsheet, but if you’d like it go to this post for the link. 5/ Pre-prep a few blog posts as back up for when I’m just too busy. No phone-ins though! I’m going to want to keep focused on my NaNo and even though I love my blog, I can see it being a distraction. I’ll keep thinking of really cool things to post and keep writing here instead of in the novel. Sadly, blog posts do not get counted toward your NaNoWriMo total. 6/ Complete my other submissions for various journals and competitions since a few are due in November and early December. This is the bottom of the list because I’m not sure how much time I can create. I’d love to get this done, since this will hopefully get my name out there, but if I can’t then I can’t. 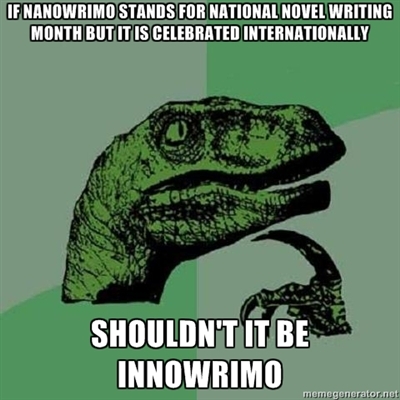 I’m still going to strive though, because that’s in the spirit of NaNoWrIMo. Can you think of anything I’m missing?